This week the Horror Duo take on a pair of Blaxploitation flicks to celebrate Black History Month. Forest issues a warning before discussing Fight For Your Life, but to the exploitative nature of the films racist dialogue - so brace yourselves. Cory plays it cool while reviewing Three the Hard Way, starring Jim Brown, Fred Williamson and Jim Kelly - a triple threat of black bad-assery! Also Forest and Cory discuss FINALLY recording Slaughter Film's Top Films of 2018, Forest talks more of being the projectionist for Film Grain, and Cory comes to the realization that he, most defiantly, WAS a viking in a previous life. All this and the two discuss what movie goers should expect February 16th during their presentation of Hell Comes to Frogtown at the Erie Movie House. For more Slaughter Film news and reviews, as well as show notes and special events, make sure to visit our website; SlaughterFilm.com. 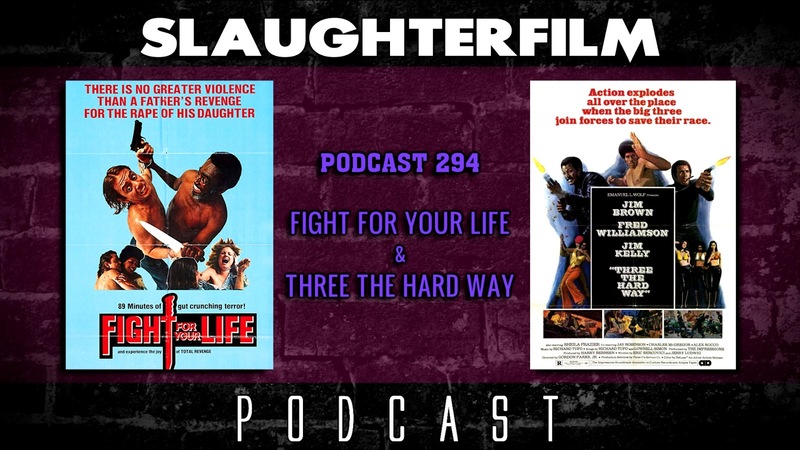 14:50 - "Fight For Your Life"
39:40 - "Three the Hard Way"